In July I traveled with my family to Europe to meet up with so many good friends in both Spain and Holland. In Madrid, Spain I met up with a great friend, Colombian percussionist Alonso Gonzalez who I know from Kuala Lumpur, Malaysia. I got to attend a rehearsal of Jaime Vásquez's band and then to attend the the performance of Pepe Rivero's band at Cafe Populart. The club was electric with Latin jazz at it's best. 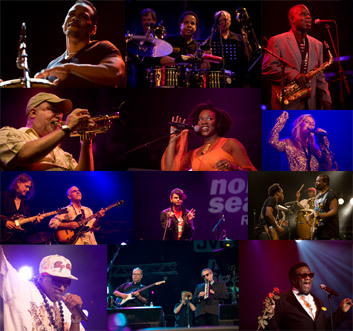 Notable amongst the musicians was Manuel Machado who was a former member of Cuba's Irakere. His trumpet playing was exquisite and I don't know if I ever heard anyone swing a band with güiro better than this guy. Special thanks to our friends at Hoshino in Holland and Ton Keverkamp and Jeroen Bakx for making possible the all-access passes that made it possible to record this historic event.